This is the New Trent folio keyboard case which fits the 2nd, 3rd & 4th Generation iPad, named the Arcadia Airbender Keyboard Case. This product is packaged in a neat cardboard box, similar to that the iPad comes in. The immediate high level of presentation is always a good start. What's very apparent when first holding the keyboard case, is that it packs a thin design. Measuring just 23mm in width, it's a little thinner than my primary padded folio case. The case is also remarkably light, weighing in at just 475g, twice as heavy as my primary padded folio case. The clamshell design is compact but completely constructed from plastic with a matte coating. Which I didn't like the feel of to begin with but now I am used to it. Using solely Bluetooth to connect to the iPad, battery life is everything. And after two weeks of on and off usage, it's still has juice. So I don't have any specific hours of battery it can hold. Charging is done over USB. Setting up the Bluetooth connection was very simple, turn the keyboard on, go to Bluetooth Settings on the iPad, type in a code to verify and you're paired. The typing experience is satisfactory with one undying flaw. To start with the top row of keys, function iPad features. You can adjust the volume and brightness, pause/ skip music, trigger spotlight search, enable the on screen keyboard and jump to the iPad's home screen. All these functions are well placed and mimic the Apple Keyboard layout. I have no trouble using them, but the sleep/ wake button is the last key on the right and directly under this key sits the backspace key. I discovered this to be a design flaw of huge proportions. When first using the Airbender to type, I constantly put the iPad to sleep when attempting to backspace. I have nearly overcome this problem but I still occasionally do it and it's super annoying. The rest of the keyboard layout is standard. Of course it adopts the QUERTY layout which 99.99% of first language English typists use. The space bar is reassembly long and CMD shortcut functions are desktop/ notebook level to access. All the buttons are scaled down in size but the chiclet layout and responsive keys, coupled with adequate, make do front hand rests and grippy rubber feet create a quite pleasurable typing experience over large periods of time. The case has a shell design and when shut it looks a little bit like a netbook. Closing and opening the case will trigger the iPad to go to sleep and awake. The hinge is very sturdy but if you don't have both hands on the case when opening, things get a little sketchy and unbalanced. This is because the iPad is clipped into a shell which is easily detachable from the keyboards casing, a very useful and novel feature. The Bluetooth connectivity means you can use the keyboard separately in close proximity. The shell the iPad sits within, attaches via an adjustable stand that can swivel a full 180 degrees and sit the iPad in either portrait or landscape view but the joint that allows the shell to detach doesn't enable it to lock into any midair angle. You can also pull the stand out and fix it into a position that angles the screen for easier view-ability and you can also remove the stand entirely from the AirBender. Again very useful. Because of the flexibility of the stand, you can swivel the iPad to sit facing up, as shown in the below photo. I find myself using the case in this fashion often because it creates the best viewing angle when the iPad is rested on my lap. The case has cutouts which of the rear camera, sleep/ wake button, top microphone, volume rockers/ mute switch and 30 pin dock connector. All functions of the iPas aren't hindered by the case, with the exception of the rear speaker. It's covered by slits to for protection but unfortunately causes slightly muffled sound and decreases the outted volume. Moving onto protection. The whole iPad is covered by the case and with it being nearly entirely made from hard plastic, it can take quite a beating. This case puts up with scratches, bumps and drops very well. The only concern I have, is if you were in a scenario where you dropped your iPad within the case, it could open as it fell to the ground because their is no inbuilt latch. To sum up, using the chiclet styled easy to type on keyboard has been a novelty, despite the poorly positioned sleep/ wake button. 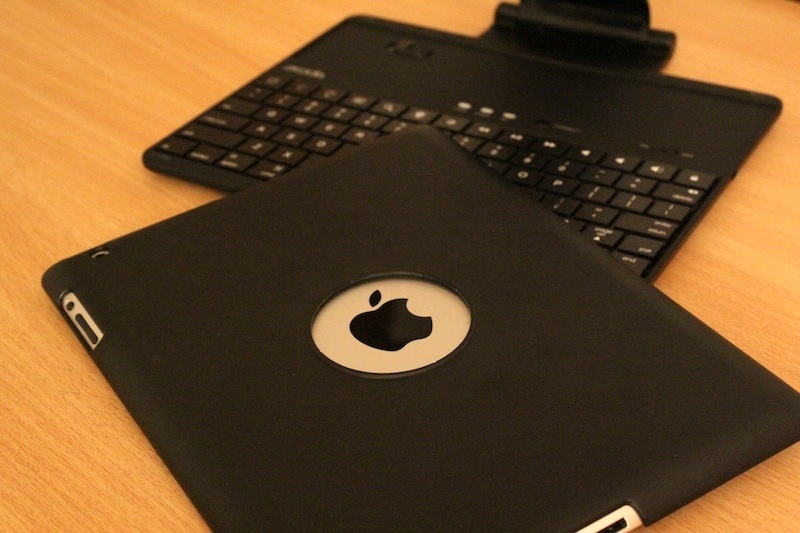 I enjoyed being able to remove the iPad from the keyboard body and still having a protective shell case on my iPad. The lightness and compactness of the case makes it no bulkier than many padded folio cases on the market and can be purchased for a reasonable $59/ £39. 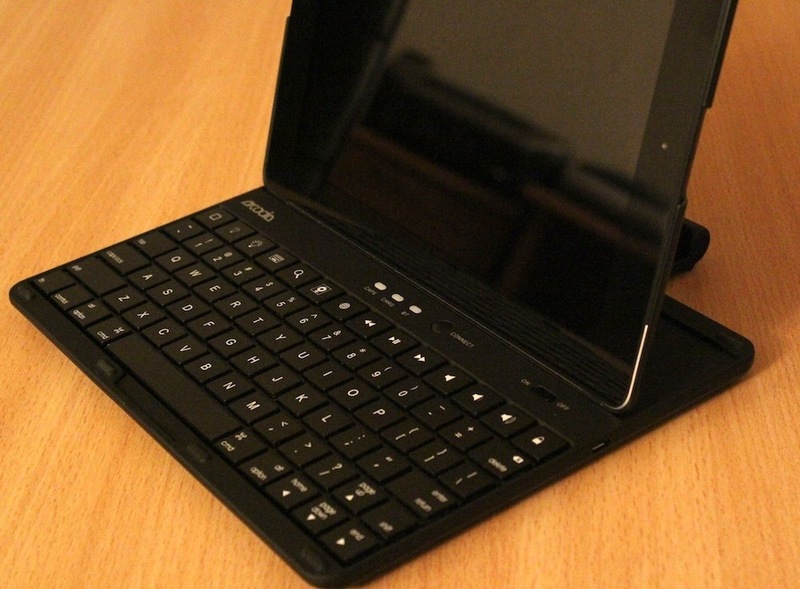 Those looking for an iPad keyboard case, should note the New Trent Arcadia Airbender as a compelling option.